Such strong words for such a humble home but my place needs action! I have found myself just in awe of Swedish decor for sometime now. I feel relaxed...refreshed. Just take a look.. I can just feel myself relax when I see this kitchen. This bedroom does not command attention it teases you with its simplicity. Family time here would be so pleasant even with my brood. Another bedroom ....another file for ideas! So after taking a soothing journey in my make believe world come on over and see what I'm getting myself into! Operation Take Down....I'm allowing myself to declutter years of "stuff". I no longer have a bedspread on my bed. I'm getting good at this takedown...watch out kids! I am stripping down to the bare basics. I even have naked windows in my bedroom. So here is what I'm up to. A garage sale this weekend at my sisters home. A lot of magazine reading and any input y'all may have. 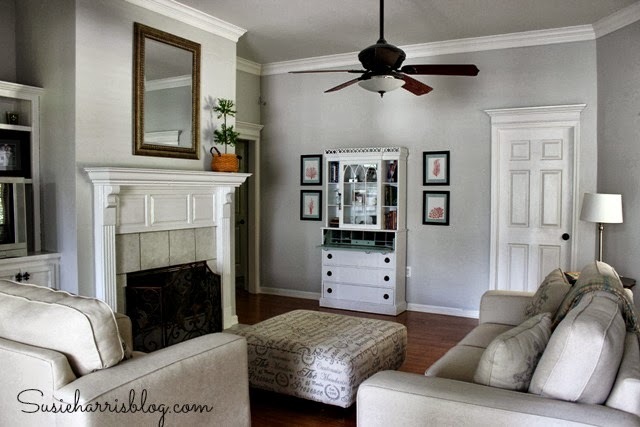 I'm ready to transform my home into a place of pale shades of natural color. Comforting rooms that invite you to stay and feel at home. Hope you want to follow along on my journey to "Swedish" this house up! 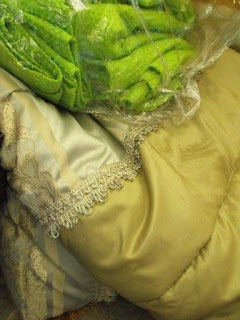 I feel some painting..Slipcover making..Drop cloth using...Earth Shaking Ideas coming!!! ps... I would start on it today but Im at the dentist having some spring cleaning done...pray for me. I hear ya...I started my take-down months ago. Got rid of all the dark colors and now it feels so much more peaceful and inviting for others. That lamp shade though, i have two similar ones. You should place it on top of an old brass one and you'll be amazed at the transformation. I get lots of compliments on mine. Warm wishes and i can't wait to see the changes! Wow, Susie, you're on a journey! Good for you! I've never been into clutter and am trying to keep it that way. I am sooo excited to follow along and see everything you do! I haven't been by in a while...but I'm sure glad I stopped by today! When we moved from Spruce Street, we relinquished almost 2/3 of our 'stuff' to young marrieds, friends, and Goodwill ~ and you know what? I haven't missed any of it. Well, there are times I miss living at Spruce and the life there, smile, but it feels great to be freed from so much! Now if I could just downsize the Christmas decor!!! Look forward to seeing the pics!!! Okies Susie Q.. if you're gonna tell me that you'll soon be having a 'tag sale'.. I best make arrangements to come on over for this event. Huggers for the new reflection. Good luck in your swedish redo. I need to do a lot of decluttering myself. Can't wait to see your progess. I'm hosting a giveaway, stop by if you get a chance. That is a dream bedroom for me, I absolutly love it!! I actually love the kitchen too...it just so so clean & crisp! I love the inspiration pictures you've shown and I can't wait to see your spin on them *smiles* It is a comforting palette isn't it? Sorry I've been MIA - work difficulties *sigh* but it sounds like you've had your own troubles with your computer, hope it's all better now! Wishing you a wonderfully blessed week and you've got my prayers for the dentist visit, that's truly not my thing at all! I feel your pain sister! i'm having a yard sale too. got to get my kitchen ready...if you know what i mean. 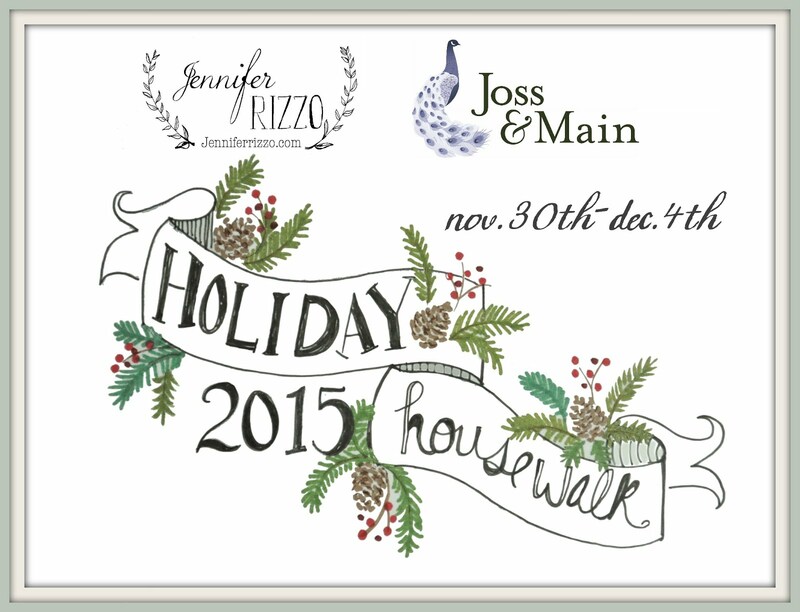 Hope you can swing by today...special treat for you. I've been feeling that way somewhat too. I've never actually been in love with lots of clutter. Space around objects just makes me feel better. You know, if privacy and extreme sunlight were not issues, there wouldn't be blinds on my windows. If you can take them off! ...oh the woes of clutter. i am surrounded by it right now...at my computer desk, in my car, at my work bench too! you have inspired me to get started de-cluttering. i will get right on it tomorrow! just kidding! i will start today! xo, mickey...love the pic's esp. 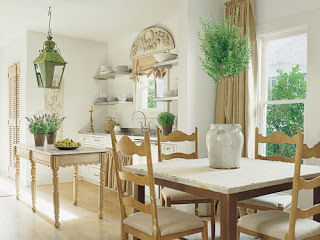 the color of the dining room with the soft white, green and light tan! I think homes can still be gorgeous without being filled to the brim with decor. Good luck with your new venture! Can't wait to see it! I'm in the middle of "thinking" about doing that myself. I just get stuck on where to start. I once joked that I could just cover the windows & start spray painting everything. I think we all want to lighten up a bit. I'm doing the same thing in the bedroom - made some sheer white panels for the windows from white muslin. 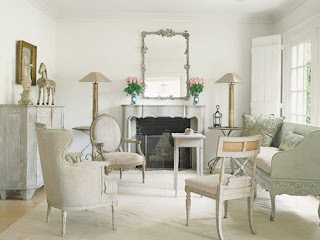 And although I can't bring myself to paint the walls, we've decided to paint the furniture a soft white and antique it. 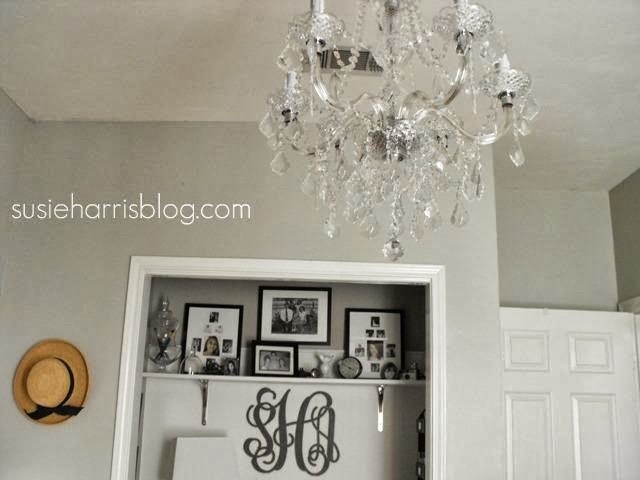 You'll make minimalists everywhere proud, because I'm sure it will be lovely! I'm with you on the lightening up.......and good luck at the dentist!!! Oh, sorry about the dentist. yuck! But I am very excited to see the transformation of your rooms! I love Swedish decor! i can't wait to see the transformation. The pictures you posted are so relaxing...makes me want to declutter too! I see the Swedish theme catching on big time! Your boxes look a little like mine because back in February when we started our remodel in the kitchen I took down everything!!! There is nothing on my walls except one picture of my children that is in black and white that I love. I don't miss the clutter and my home feels much more calm. One of my favorite websites is http://moderncountry.blogspot.com/ and on her side bar she has many of the blogs that she follows listed. I can't read some of them but I browse the many gorgeous photos. 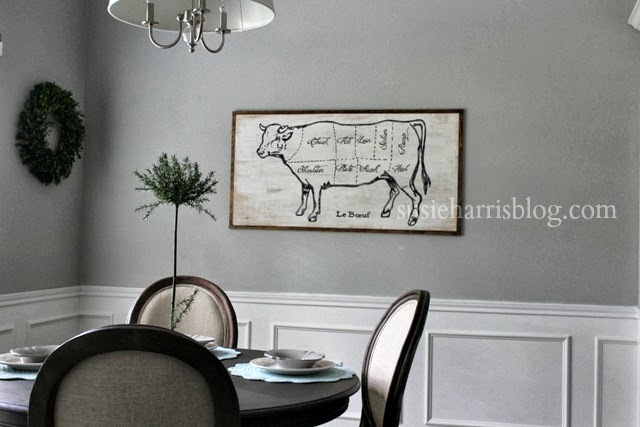 Are you planning to do a white color on the wall? I am struggling with this as I love the whites and creams. It is so hard to choose. Anxious to see what you do! Oh good luck with the dentist, not my favorite place to be. I can not wait to see your changes. I know whatever you do it will be beautiful! 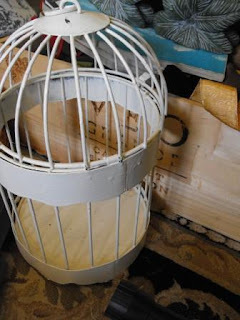 I would love to be at your garage sale....too bad the little things can't be on your blog for sale....another blogger did this and it was pretty neat...good luck with the sale and can't wait to see all the new ideas you do for your home. I cannot wait to take this jorney with you - I've never been one for clutter or stuff. Love that the simple things are in style. I'm right there with you, Suzie! That's exactly why I painted my bathroom (that sent me to the hospital!). It's just beautiful, calm, and relaxing. I'm almost done with my bathroom, though. Can't wait to see what you do! Oh I used to save NOTHING. Oh the things I sold in garage sales that I could have used in this new house. Now I mostly sell what is outgrown:) I tend to save more in this house only cause I have rotations of things that I set out. I have them organized in plastic drawers in the basement. I also have big bunch of antique runners and things that I really should go through and see what I should keep. Maybe I could sell the rest on etsy?? I think your home looks lovely as it is, but I will enjoy watching your transformation. 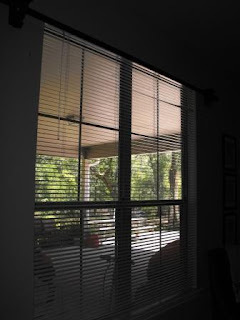 I am doing a lot of the same thing..no curtains in most of my house..just blinds..going to take up large area rugs and put them away for the summer..woo hoo....all I can think of is SPARSE, CLEAN, COOL, UNCLUTTERED..Oh, my...I still have a LOT of work ahead of me to get to THERE!! Good luck! The Boyfriend and I aren't really into extra "stuff" and it drives our mothers crazy -- they are both major keepers! I think I actually get a little to excited to get rid of stuff, I find it freeing! Can't wait to see the results. Love that style. It's so simple yet beautiful. I know from experience it's hard to let go of pretty things. Best of luck to you! I can't wait to follow along on your journey and see what you end up doing. Good luck at the dentist today! Good for you! I love Swedish style, too. I can't do all the white furniture with three dogs and two cats, I can definitely live without the clutter. It starts to make me nervous when I have "stuff" on every surface. I am so looking forward to the transformaiton! 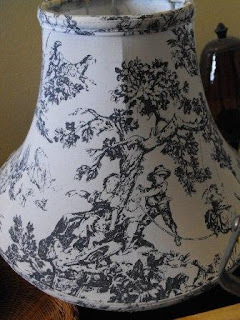 How much do you want for the black and white toile lamp shade? I love it!!! Does your sister live in Birmingham? I would love to come to your yard sale and buy your stuff! Everything you have is soooo cute!!! Oh, how fun!! I love going through and having a "take-down" every now and then although yours sounds much more advanced. :) I can't wait to see some before and afters!! I love the cool colors - but will always have lots of extra "fluff" as you call it. I have far too many things that were collections of my Mother/Grand Mother etc., that bring back too many good memories to get rid of them for the sake of a clean counter top...so alas - all those pretty magazine photos will, at least in my home have to stay in the magazine! Can't wait to see your finished product. Have fun! Sounds fun! I can't wait to see what you do with the place. I hope your visit to the dentist was easy and quick! Good luck - what an exciting task you're beginning! 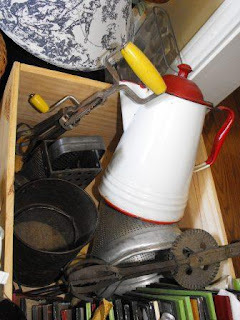 I need that box full of old kitchen gadgets and the red/white kettle you posted! That's my farmhouse/prim style! Yep! Simplicity is amazing. 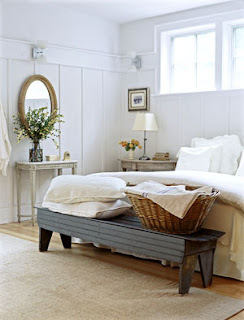 I am far from the simplicity in those pictures, but yearn for the open, clean, airy look. Victoria and I are having a yard sale soon, and some of my clutter is going too. Look forward to seeing your journey. Oh I wish I lived by you! I would buy that coffee/tea pot that is white with the red lid and handle. It would go perfect in my kitchen! I bet you are going to have the best garage sale! I, too, have done this. Actually, when I realized that I was buying things that just ended up in the next garage sale, I knew I had to stop. 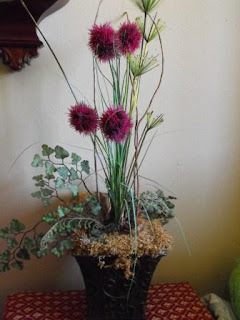 I have pared down many accessories and continue to look for simple things everywhere I look. I have long been a fan of Danish design and maybe my home will look similar one day. I'm proud of a decorating diva that knows when enough is too much. :) It will be fun to see your transformation. oh my goodness! i wish i lived nearby! that garage sale with your stuff would be a dream to me. i understand your journey for zen-i am too much of a pack rat still! oh and a toile lamp shade! i could die! me too! i love the calm look! That's awesome!! I'm also in the middle of stripping down. I have some major changes ahead of me, and it's time to simplify. LOVE that kitchen!! I think I'm going to file that away too. You are a brave woman. 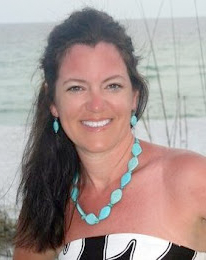 My hubby may pack his bags and never come back if I completely overhauled. I get that urge more than I would like to admit! Love that toile shade! Yes, we need some major decluttering going on here, too. My fringe is growing like kudzu and has spread from my craft table to my dining table! I guess that's technically not clutter, but right now it sure feels like it! Change is always so refreshing. I'm doing it on a smaller scale and getting a new hairdo! A whole home makeover will be fun to watch you do! Those spaces are just wonderful. Ever since I stayed home I have been going through and decluttering. Those rooms are ideal. Such serene spots to spend time in. Can't wait to see what you decide to do. can't wait to see the transformation... check out my transformation also. all i can say is ME TOO!!! i'm so sick of stuff, clutter, fluff THINGS! i love your inspiration photos. so pretty! Wow!! 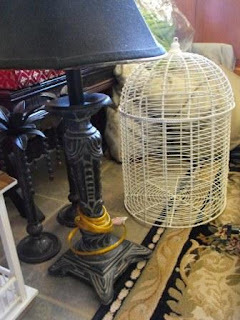 You have such a beautiful home with full of awesome decorative stuff... It's so calm and relaxed environment! !